Ex-Eltronics utilises its procurement knowledge, program management skills, engineering expertise and association with local and international contract manufacturers to manage the production of specific parts, or the assembly of cable harnesses, PCBs, sub-systems and even finished products. This value-added capability has been of particular benefit to enterprising SMEs who wish to focus their attention on their IP and product development and not be detracted by the logistics of manufacture. 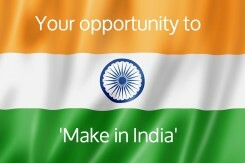 Larger OEMs are being assisted with the sourcing of mechanical and converted parts to customer drawings, which are often related to an international licensed program , but also profiting from the cost efficient manufacture of our Indian partner, Miracle Electronics. Their impressive export facility houses a professional team of engineers and operatives that design and produce high quality wound magnetics and cable assemblies and, with the support of local contractors and processors, part of full turn-key solutions. Our association with them means that our clients can “Make in India”, without investing there themselves, benefit from the cost efficient manufacture it affords and leave us to manage the communication, the build and the importation logistics. Another principal, Staco Systems, has the engineering expertise and production facilities to produce high-reliability, precision electromechanical and optical sub-systems specific to your application. Their capability would be used for requirements of this nature. All production managed by Ex-Eltronics is performed within AS9100 / ISO9001 / ISO13485 approved operations and workmanship is to IPC620 standards. Ex-Eltronics has been a highly reliable, accredited supplier of tailored procurement services to Defense and Aerospace OEMs since its formation in 1976. Ex-Eltronics provides tailored kitting solutions for aftermarket and overhaul requirements within the scope of our AS/EN9120:2010 approval. Through local and offshore partner companies, Ex-Eltronics offer a complete design through to manufacture service. Ex-Eltronics represents professional overseas manufacturers of wound magnetic products and motion sensors.